One of the most dramatic changes you can make in a bathroom is also one of the easiest for a DIYer. 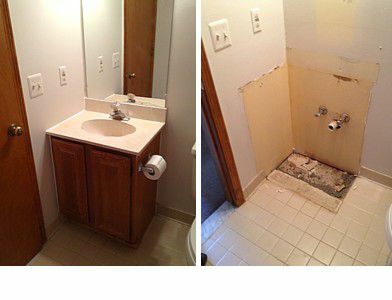 Replacing a vanity cabinet and sink/faucet can make a radical transformation in your bathroom, even if no other features are changed. 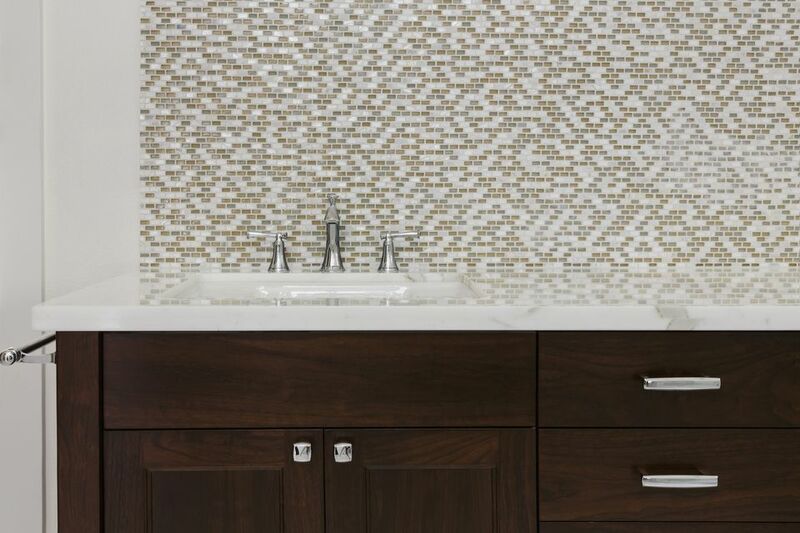 Today's vanities may come with granite or synthetic stone (quartz) countertops and integrated sinks, and they can be surprisingly8 affordable. Many styles are available on the shelves at big-box home improvement centers, and dozens more are available through special order, in both contemporary and classic traditional styles and colors. Before installing a new vanity/sink/faucet combination, though, you will need to remove the old vanity cabinet. The job is not hard, but it requires some labor and a few tools, most of which you probably already own. The first step in removing the vanity is to locate the water shutoff valves and turn off both the hot and cold water supply lines running to the faucet. There should be shutoff valves for both the hot and cold water pipes, usually found near the stub-out pipes coming through the back wall or floor of the vanity cabinet. To shut off the water, turn the handles on these valves clockwise to the full closed position. Make sure the valves are fully closed, and watch carefully for drips as you start the next step. It is not uncommon for shutoff valves to wear out, and if so, they may fail to shut off the water fully. If your vanity faucet does not have shutoff valves, or if they don't work properly and fail to shut off the water, you will need to find the shutoff valve for the main water supply and shut off the water there. Once the water is shut off, open the faucet fully to releasing any pressure and let the water drain out. Once the water supply is shut off to both the hot and cold water lines, the next step is to disconnect the water supply tubes. Place a bucket under the shutoff valves to catch any spilled water during supply line removal. Using an adjustable wrench, turn the supply tube mounting nut counterclockwise to loosen it from the shutoff valve. When the mounting nuts are loose, disconnect the flexible supply tubes from the shutoff valves. If the valve uses a compression fitting to hold the water line to the valve (such as shown here), there will be a small copper compression sleeve on the water line under the compression nut. Inspect the shutoff valve closely to make sure there is no leaking. If water continues to seep from the valve, you will need to find the main shutoff valve for the house and shut off the water there. Before continuing with vanity removal, you replace any faulty shutoff valves. With the water lines disconnected, the next step is to disconnect the drain pipes, known as the P trap because of its shape. The P trap will be made either of PVC plastic, as shown here, or chromed brass. PVC plastic drain traps may have large slip nuts with ears that can be loosened by hand. If the P-trap is made of chromed brass or PVC with standard slip nuts, then use channel-type pliers to loosen the nuts in a counterclockwise direction to disconnect the fittings. Remove all the drain pieces from the P-trap, from the sink drain opening to the drain opening at the wall. If the mirror rests on top of the vanity, as it does in some installations, you should remove the mirror before going any further. Loosen any brackets holding the mirror to the wall, and carefully remove the mirror from the bathroom. Vanity tops are usually sealed against the wall with silicone caulk, and removal will be easier if you first cut this caulk bead to sever the joint. Using a sharp utility knife, cut the caulk bead lengthwise down the center of all joints. There may also be a caulk bead running down the side of the vanity cabinet, along the wall. Take care not to cut into the wallboard as you are slicing the caulk bead. Use patient, firm pressure and a steady hand, striving for a long, continuous cut. Once the bond has been broken by scoring the caulk joints, you can remove the vanity countertop. There is usually no reason to first remove the faucet or sink (if it is a separate unit)—they can be left attached to the countertop for removal. Look underneath the vanity top to see if there are clips or brackets that hold the countertop unit to the vanity cabinet. If so, unscrew and remove these brackets. Carefully grab the front of the countertop and lift. You should feel the front edge easily lift off the cabinet. If you cannot lift the vanity top and no mechanical clips are holding the top in place, then the previous installation probably used a construction adhesive or sealant to bond the top to the sink base. In this case, use a small pry bar to lever the countertop unit away from the vanity cabinet and release the bond. Carefully lift the vanity top from the sink base, trying to minimize wall damage. You may have to cut any lingering caulk joints that are still present. With heavy stone, marble, or tile countertops, this action is best done with the assistance of a helper. Remove the countertop and sink from the bathroom. With the vanity countertop and sink removed you can now easily access the inside of the vanity cabinet. Check the perimeter of the base cabinet to determine where it is attached to the wall. If the countertop is attached to the walls with screws, simply remove the screws to free the cabinet. If the vanity cabinet is attached by nails, use a pry bar to bet under the nail and lever the mounting strip to separate the cabinet from the wall. You can also try the claw end of a hammer, but it may be difficult to get the claw edge under the nail head. Once the fasteners are removed, the vanity cabinet will be easy to remove from the wall. Note: if the old vanity cabinet is rather large and difficult to remove through the bathroom door, an alternate method is to cut it into pieces with a reciprocating saw. This method means you won't be able to reuse the cabinet, but it can be much easier than trying to maneuver a large cabinet in a confined space. This is also the method of choice if your vanity cabinet was custom built in place, which is often the case in older bathrooms. With the vanity countertop and cabinet removed, you now have a cleared area for a new vanity installation. Remaining caulk needs to be removed from the wall with a scraper and any damaged drywall repaired with spackling compound. The area is then ready for fresh paint and a new vanity. This may also be a good time to install new shutoff valves if you haven't already done so. Can You Buy Cheap Bathroom Vanities Online?